TouchPad Roundup: apps, rumors, and an easter egg? TouchPad news has been flying in at a really rapid pace and while we've already hit the big stuff, there's plenty of smaller bits that are worthy of mention today. Let's round 'em up. Pressebox.de has a press release touting "exclusive apps for the new HP TouchPad" including AlloCiné, Sooloos, Marmiton Touch, Orange Mécanique, Auto Motor and Sport, My HP, TV drama, Gala, Cinema, Focus Online, N24, stern.de, OK Magazine, and of course, Kindle for webOS. Thanks Shoe! @renehennig attended a webOS Connect event in Paris where he heard HP's Richard Kerris say that webOS 3.0 on the TouchPad will eliminate the problematic geographic restrictions that have kept previous webOS devices from switching their default country. via webosroundup, thanks Mike5! Looking through the document we just leaked suggesting the June 12th launch, we see that the TouchPad will ship with a 10W AC adapter (just like the iPad). We also see that HP seems to be launching with just two accessories: the case and the TouchStone stand. An anonymous tipster writes in that there will be a FaceBook app for TouchPad / webOS 3.0 - again developed by Palm with help from FaceBook - that will be "completely different" and have Facebook Messaging built into Synergy. Thanks anonymous! 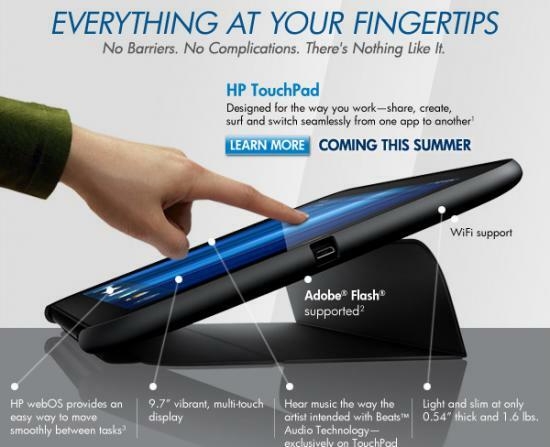 Finally, HP has been showing off the TouchPad at the HP Byron Nelson PGA Championship. An attendee wrote in to say the HP rep on hand said the TouchPad is coming "very soon" and that the Pre 3 will come a bit later (in the "60 to 90" day range). The tipster also got a demo of an easter egg: "If you pulled a card down, it stretched like a slingshot and then flew away and 'yelled' (think angry birds), pretty cool." Thanks anonymous!